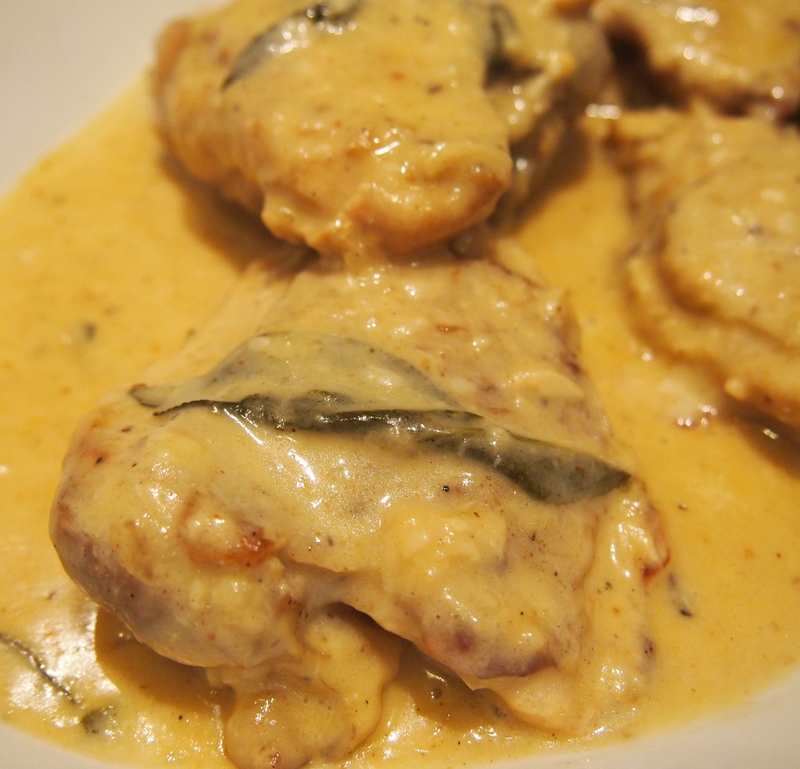 This chicken dish is done in the style of many French braises in that the chicken is first browned well and removed and the sauce is then made in the same pan utilising the caramelised crust created by browning the chicken to make a great base for a sauce, in this case using white wine, mustard and a little cream. It’s really important to take the time to brown the chicken well. This will make the difference between a final dish that tastes good to one that tastes great. 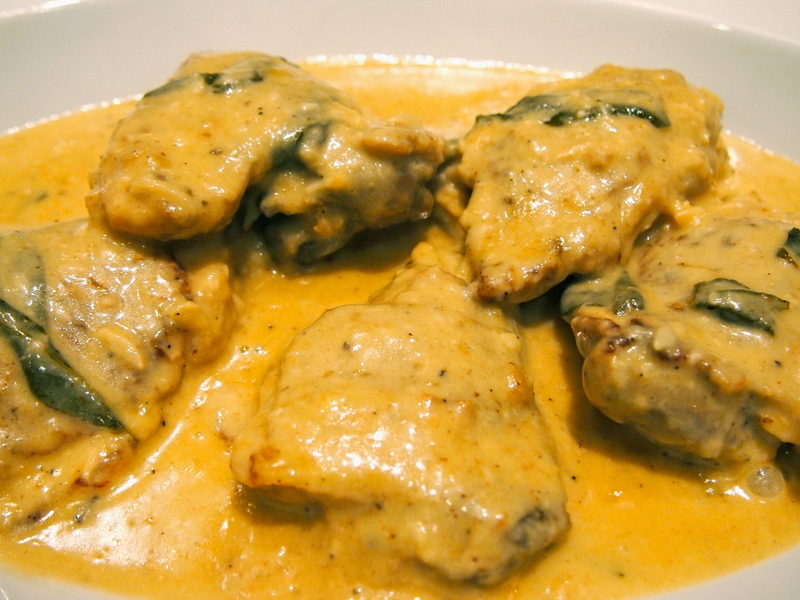 The sauce is truly delicious and as we’re a gravy centric family I doubled the amount of sauce in the recipe below so as there’s lots to go around. Something to mop up the sauce in the way of mashed potatoes would be great but if you don’t have the time a nice crusty loaf of bread and a green salad would make a fine dinner. 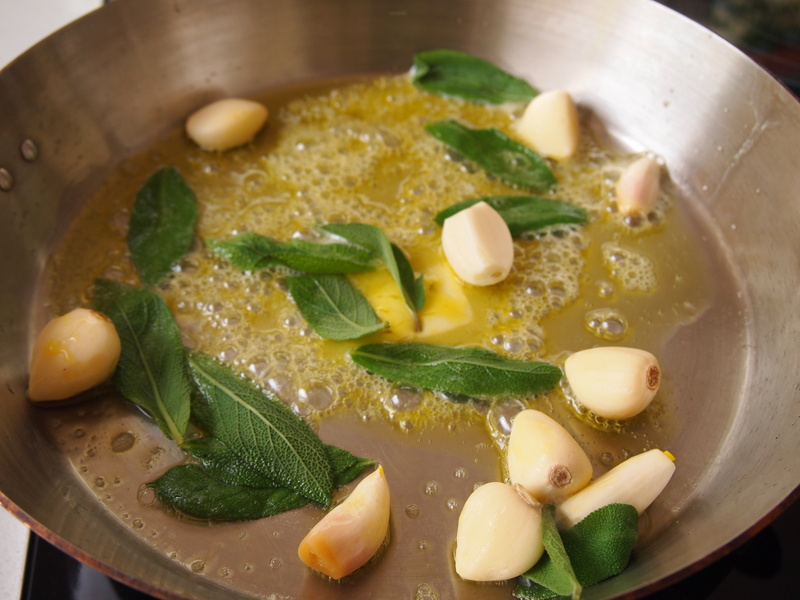 In a large sauté pan add the butter and the olive oil, the sage leaves and the garlic cloves. When the butter starts to sizzle add the chicken thighs skin side down and let them get golden brown over medium heat. Turn them with a spatula without damaging the chicken and brown the other side. They will be cooking later so you just want to get the nice gold brown colour now. Heat the chicken stock. Remove the chicken from the pan and all but 2 tablespoons of the fat, add the white wine and the cognac and deglaze the pan, scraping any pieces of meet stuck on the bottom. Let the alcohol evaporate completely, then add the mustard and dissolve in the sauce with a whisk. Add the chicken to the pan and add the hot chicken stock to ¾ of the height of the chicken thighs. Season with salt and freshly ground black pepper and let simmer over low heat, covered, for 30 minutes. 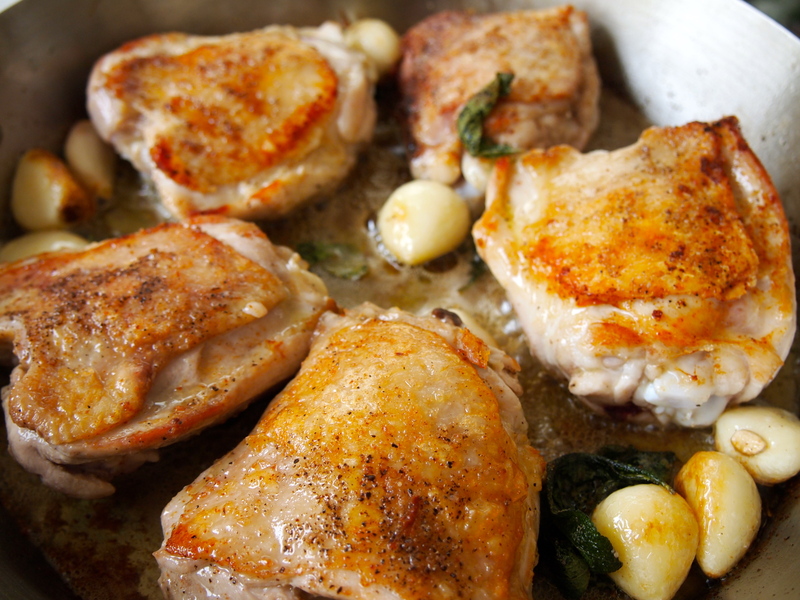 Remove the cooked chicken thighs and keep warm. 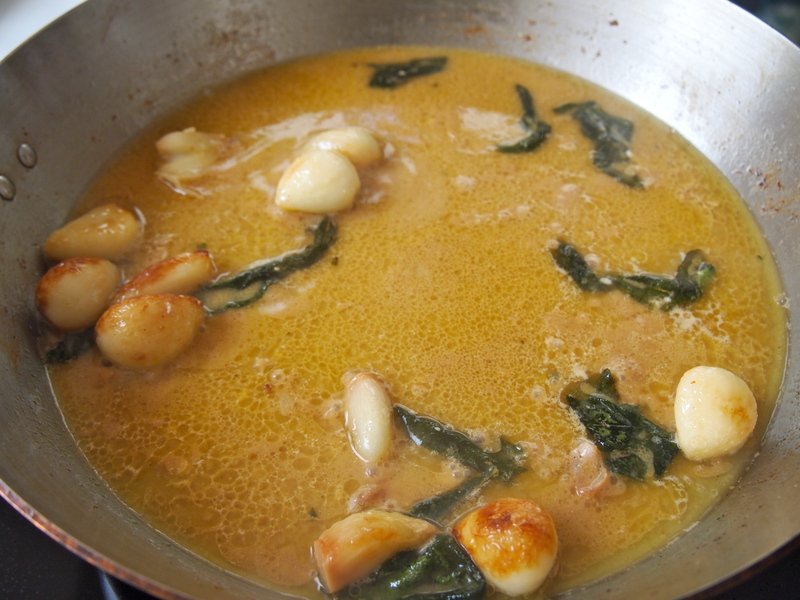 Let the sauce simmer over low heat to reduce to as much as you will need for the thighs. Sift the flour and dissolve it in 3 tablespoons of cream using a whisk. Add the remaining cream and whisk. Now add a bit of hot sauce, whisk together very well and slowly pour in the pan. Keep whisking so the sauce doesn’t stick to the bottom. Let the sauce reduce again to the amount you need, always stirring. I like to have about two cups of sauce to serve with the chicken thighs. Put the chicken back into the pan and bring back up to a simmer so as the chicken is heated through and serve immediately. Sage + cognac + chicken = awesome combo. This looks so good! Thanks for your comment Emily, it is a winning combo!